Does your mom or dad require daily nursing care and other support services? Consider moving them to a facility that provides complex care for seniors. Sometimes referred to as long-term or continuing care homes, they provided dedicated care for elderly patients suffering from chronic illnesses, disabilities, and following hospital treatment. 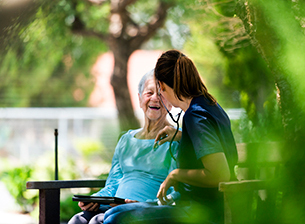 While many seniors believe it to be a last resort, complex care nursing homes also look after recovering patients that need regular onsite physician attention and assistance by specialized medical staff. The experienced nursing and rehabilitation team at The Holiday offers valuable insights into complex care facilities to help you make the right choice for your parent. Complex care facilities like The Holiday provide comprehensive health services to meet the unique needs of each patient and optimize their quality of life. A suite of interdisciplinary, diagnostic, therapeutic and technological services help cater to a range of physical and cerebral impairments caused by chronic and debilitating conditions such as stroke, cancer and dementia. The length of their stay usually depends on your loved one’s treatment requirements. Typically, only patients with complex and intensive clinical care needs, or those requiring end-of-life care, may need to stay for extended periods of time. Complex care for seniors typically begins with a detailed physical, emotional, and Medical evaluation to determine a proper treatment plan. This can include an assessment of cognitive functions as well as your senior’s ability to perform daily tasks (activities of daily living – ADL) such as bathing, dressing, feeding, grooming, going to the toilet, medication management, shopping, cooking and cleaning. 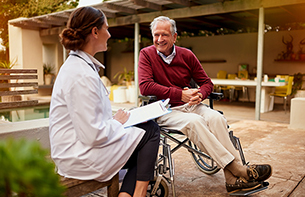 As needs change, your case manager will collaborate with the care team, patient, and family to modify the treatment plan and/or ensure your loved one has the necessary support to live comfortably and safely at home. The goal for most patients is to restore as much function as possible so they can return to the community. Those in need of continual assistance may move to an assisted living facility or nursing home. At The Holiday retirement communities, we offer high-quality services to help you recover. In addition to the latest medical treatments, we have a wide range of programs and activities for patients. Our comfortable accommodations, delicious and nutritious meals, and personalized care by a dedicated team contribute to positive patient outcomes. We also have well-appointed independent and assisted living facilities where staff looks after your loved one like family.